We thank David E. Georgi, M.D. 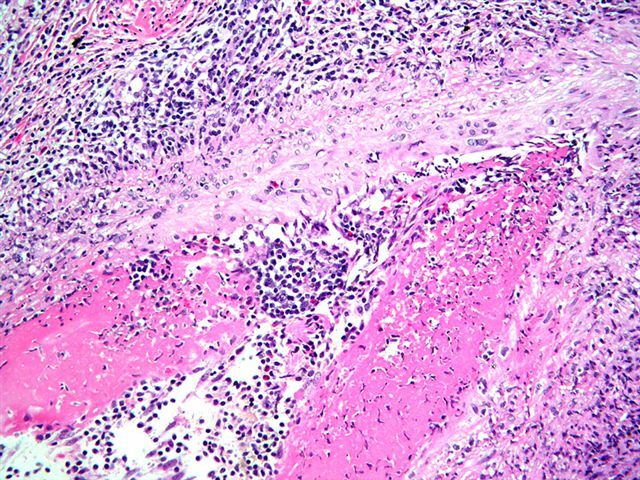 and Preetha Ramalingam, MBBS, Medical College of Georgia (USA), for contributing this case and the discussion.� To contribute a Case of the Week, please email info@PathologyOutlines.com with attachments of microscopic images (any size, we will shrink if necessary) in JPG, GIF or TIFF format, a clinical history, your diagnosis and any other images (gross, immunostains, etc.) that may be helpful or interesting.� We will write the discussion (unless you want to), list you as the contributor, and send you a check for $35 (US) for your time after we send out the case.� Please only send cases with a definitive diagnosis. 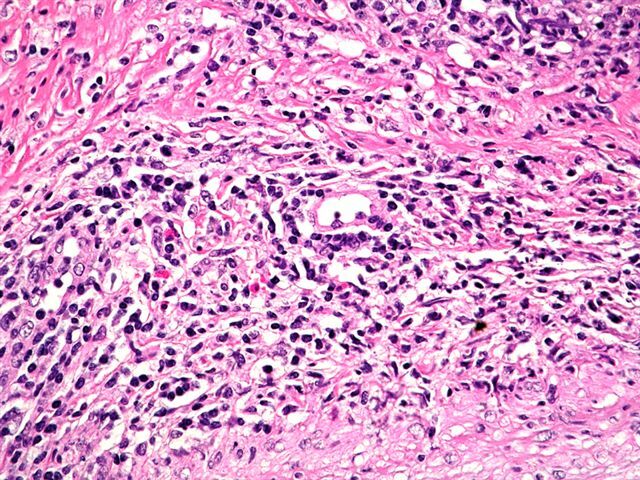 A 44 year old woman with previous cervical biopsies showing CIN II-III had a cervical loop-cone biopsy.� The specimen showed focal residual CIN I with HPV changes arising in a background of focally atypical immature squamous metaplasia.� Resection margins were free of dysplasia.� The patient had no other significant past medical history. Polyarteritis Nodosa (PAN) is a rare primary vasculitis, usually of unknown etiology, that affects muscular arteries at branch points.� It produces lesions of varying stages of evolution, as well as aneurysms.� It usually affects the kidney and GI tract.� Two-thirds of patients are male, and most are age 50 years or older. Isolated PAN of the female genital tract is rare.� Abu Farsakh et al reported 2 cases of isolated vasculitis involving the female genital tract and compared them with prior cases.� They divided necrotizing arteritis into a giant cell arteritis type, which primarily affected post-menopausal women in any part of the female genital tract; and a PAN-type vasculitis, which affected the cervix of younger women, similar to our patient.1 �Since this patient had only a loop cone, it was not possible to assess the presence of vasculitis elsewhere. Vasculitis of any type affecting the female genital tract is usually an isolated finding.� Ganesan et al studied 46 patients with vasculitis in the female genital tract, with an average followup of 3 years.2�� Only four patients initially or subsequently had systemic disease. The parthenogenesis of PAN is unclear.� The inflammatory cells are mainly T lymphocytes and macrophages 3.� An isolated necrotizing arteritis appears to be immune complex-mediated. The patient in this case has been followed for 17 months, and has not progressed to systemic PAN.� It is important to recognize isolated PAN of the female genital tract as an entity so that it is not mistaken for systemic vasculitis.� On the other hand, an appropriate workup may be helpful to rule out the rare systemic cases. 1.� Abu-Farsakh H, Mody D, Brown RW, Truong LD. �Isolated Vasculitis involving the female genital tract; clinicopathologic spectrum and phenotyping of inflammatory cells. Mod Pathol 1994;7:610. 2.� Ganesan R, Ferryman SR, Meier L, Rollason TP. �Vasculitis of the female genital tract with clinicopathologic correlation: a study of 46 cases with follow-up. Int J Gynecol Path 2000;19:258. 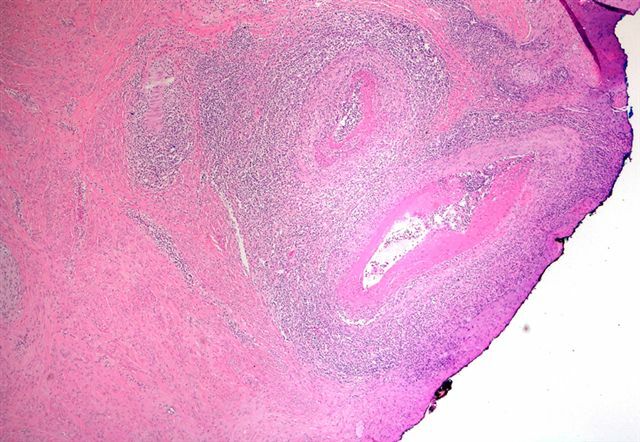 3.� Francke ML, Mihaescu A, Chaubert P. �Isolated necrotizing arteritis of the female genital tract: a clinicopathologic and immunohistochemical study of 11 cases. Int J Gynecol Path 1998;17:193.